Modern data is vast, unstructured, and sometimes unwieldy. It's big and complicated, and we have big expectations for what it can do and trying to store, process, and analyze all of it has led to the development of NoSQL databases. These document-based databases eschew the table-based structure of relational databases and let you group data more logically. The leading NoSQL database, MongoDB, has come out ahead in the field as an open-source and cross-platform compatible. Instead of using tables and rows as in relational databases, MongoDB is built on an architecture of collections and documents. Where documents comprise sets of key-value pairs and collections contain sets of documents & function as the equivalent of relational database tables. MongoDB's document model is simple for developers to learn and use, while still providing all the capabilities needed to meet the most complex requirements at any scale. It has some impressive built-in features that make it an excellent choice for businesses that need fast, flexible access to their data, whether it's to make real-time, on-the-fly decisions, or to create tailored, data-driven experiences for users. MongoDB was created by Dwight Merriman and Eliot Horowitz, who had encountered development and scalability issues with traditional relational database approaches while building Web applications at DoubleClick. In 2009, the software company 10gen make it available under General Public license for free and it is also available under Commercial license from the manufacturer. MongoDB is written in C++ and supports dynamic schema design. It uses document storage and data interchange format called BSON, which provides a binary representation of JSON-like documents. Automatic sharding enables data in a collection to be distributed across multiple systems for horizontal scalability as data volumes increase. According to Merriman, the name of the database was derived from the word humongous to represent the idea of supporting large amounts of data. 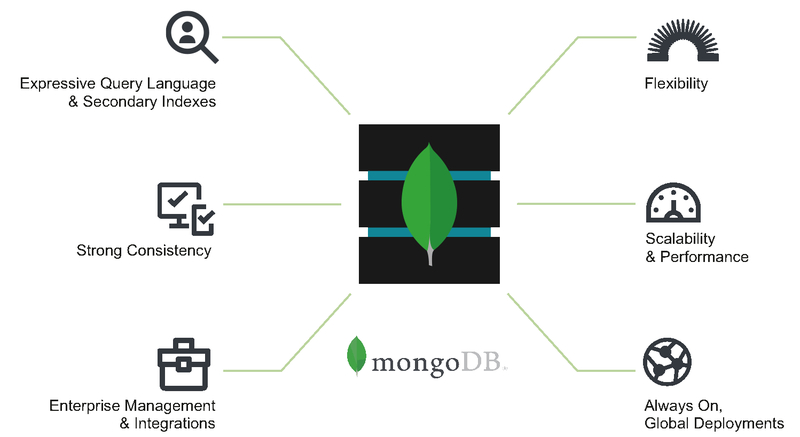 MongoDB is designed to meet the demands of modern apps with a technology foundation. In MongoDB, the document data model presenting you the best way to work with data. A distributed systems design that allows you to intelligently put data where you want it. A unified experience that gives you the freedom to run anywhere that allowing you to future-proof your work and eliminate vendor lock-in. With these capabilities, you can build an Intelligent Operational Data Platform, underpinned by MongoDB. MongoDB Inc. launched a cloud database as a service called MongoDB Atlas in 2016. Atlas runs on AWS, Microsoft Azure and Google Cloud Platform. More recently, MongoDB released a platform called Stitch for application development on MongoDB Atlas, with plans to extend it to on-premises databases. The company also added support for multi-document ACID transactions as part of MongoDB 4.0 in 2018. Today, many big companies like MetLife, CERN, The New York Times etc. are using MongoDB as customer service applications, a form-building application for photo submissions.